I started listening to a new podcast, called Heroines of the Cherry Blossom (or CBHeroines), mainly because I enjoy the ladies on it, and not really knowing much about it. I soon learned that it covers the otome genre, which is something I’ve been interested in ever since playing through Hatoful Boyfriend. I’ve learned a lot from Pizza‘s and Sushi‘s podcast, and chatting with them on Twitter, and you should check them out! In fact, in their latest podcast, they talked a bit about Hatoful Boyfriend. We had gotten into a discussion on Twitter, and Sushi asked me why I enjoyed the game so much. So I talked about how I could see distinctions in the character types that reminded me of Ouran, how I loved the story and the humor, and that I thought the writing was superb. She, Pizza, and a few other folks also gave me and some other folks some suggestions on some otome to try, which they also covered in the most recent podcast. Then, Aggrochat picked up on the conversation (since the ladies mentioned them and their Hatoful podcast), and discussed story-driven games and otome. It really helped to drive my desire to play some more visual novels, focusing on otome, and I kind of gave in and downloaded a mobile otome to play. While it’s cute and I’m enjoying it, I’m not enjoying the “daily login” aspect or the fact I’m kind of being nickled-and-dimed and time-gated on the story unless I want to drop $1 per “ticket” for maybe 15 screens of text. I’d honestly rather drop the money on a full version of a game for a platform I own that isn’t mobile (preferably Steam… though I’m trying to convince Chaide I need a Vita so I can play some otome games that don’t have PC ports). That’s where Seduce Me came into play. I recently delved into a website that lists English Otome Games via platforms, and I went right to the PC list and found Seduce Me. I had come across it on Steam, but not looked into it because the title seemed a little (1) steamy and (2) cheesy. But it got extremely good ratings on the website, so I figured I’d give it a try since it’s free. Yep. 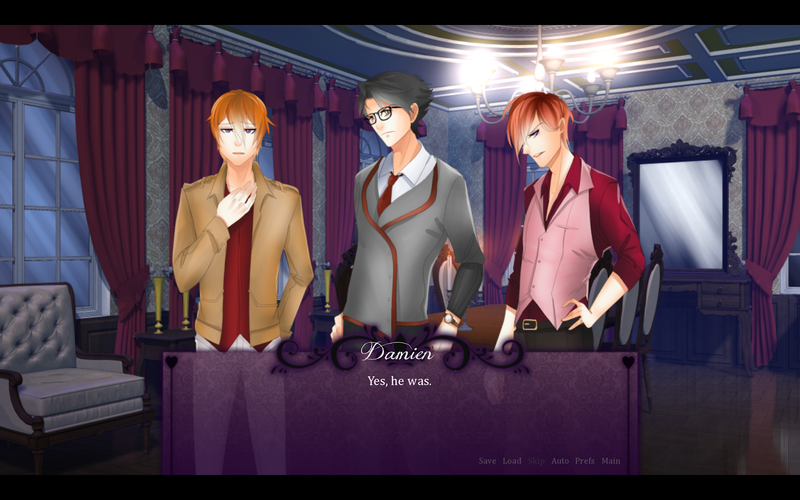 A free otome game that I can download onto the Mac to play during lunch at work? SOLD! I thinkI’m going to have to go for James first, and then Damien. So I downloaded it and booted it up at lunch… and can I just say that I’m addicted and I don’t want to play anything else until I have finished all of the available endings for this game? I laughed so hard at this and some of the other dialogue! So far I’m loving the story, and I love the art. I love that it’s all voice acted, too, though Erik’s voice reminds me far too much of Kevin from Welcome to Night Vale (audio story podcast), and that creeps me out a bit. It’s fitting, for sure, but it still creeps me, so he’ll definitely be one of the last I choose. I also love the humor in the game. It reminds me a lot of Hatoful in that respect. Matthew made me a toy… yeah… he meant well! So I accepted it anyway! 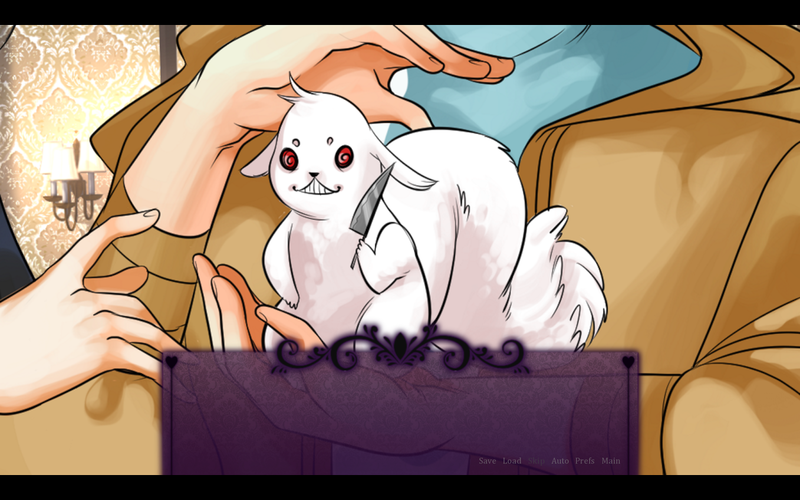 But, being new to the otome genre, I’m confused about some of the archetypes presented, if all games work in the ending department like Hatoful and have a “normal” and “extended” ending, or what. I am excited to discover what I should be expecting from an otome, and having the Steam Achievements will help, some, too. 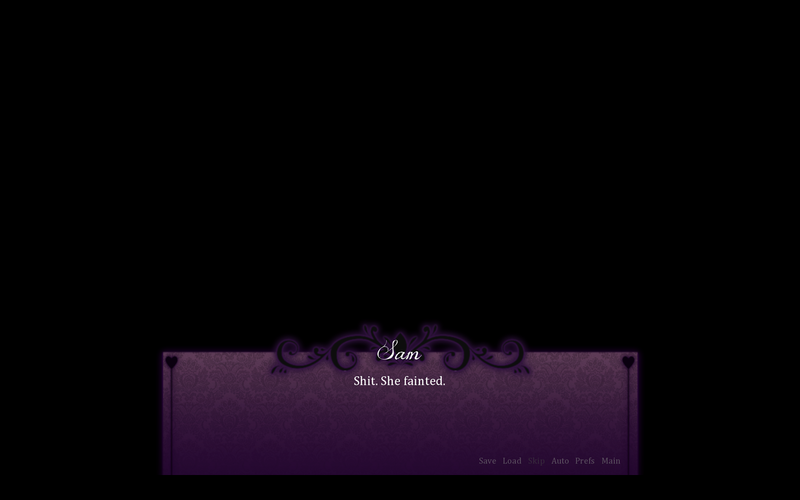 Though I’ve not really figured out how to get specific paths since it’s my first true otome. Regardless, I’m definitely going to enjoy this!